Written by John Jennings on January 10, 2019 . Posted in Uncategorized. 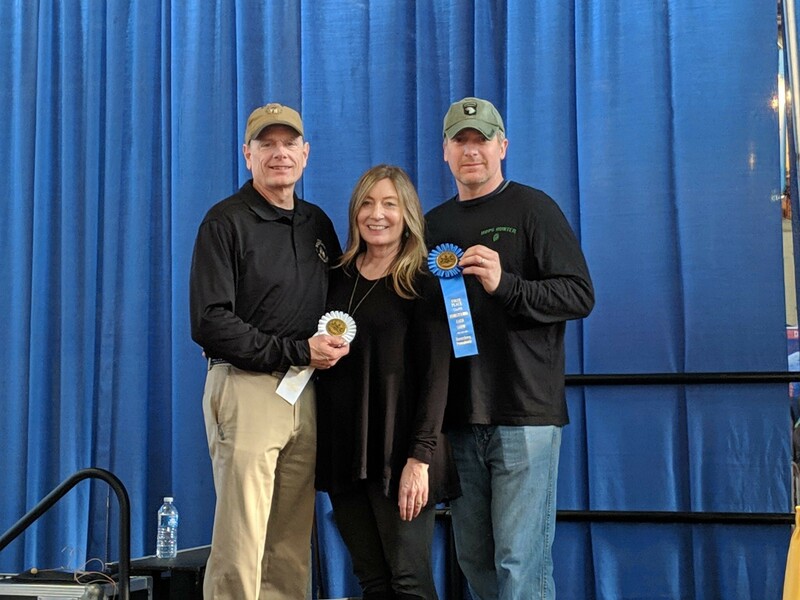 Olde BBC is proud to receive two awards from the first Pennsylvania Farm Show Beer Competition in January 2019. 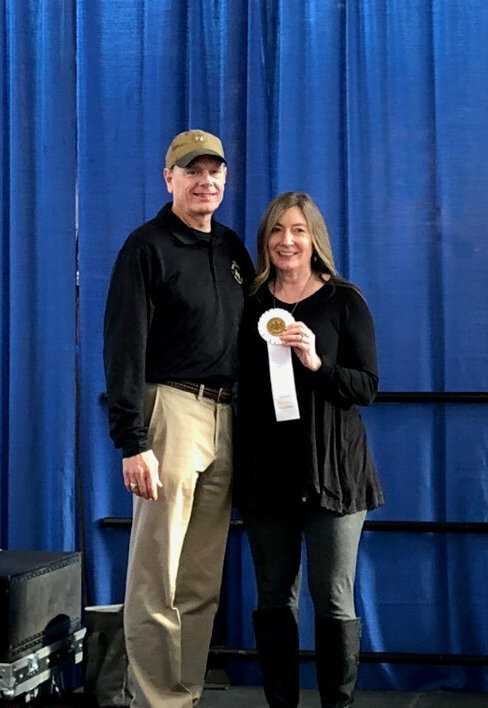 In early December 2018, expert judges evaluated 152 entries in 14 categories from 28 craft breweries across the state. Entries ranging from Schwarzbiers to Hefeweizens, and Saisons to Stouts illustrated the diverse range and quality of Pennsylvania-produced craft brews and the creativity of the state’s brewers. Olde BBC entered two brews in “Fruit, Herb, Vegetable” category. “Fat Jimmy’s Arancia Orange Peel Wheat” won Third place in the competition. And we are proud to announce that our “Sons of the Forest Spruce Tip Ale” won First Place! Below are pictures of owners David & Mary Heller and Assistant Brewer Jay Thorpe. Written by John Jennings on October 28, 2018 . Posted in Uncategorized. Brewers of PA is a non-profit association that brings together leaders of Pennsylvania based breweries, businesses that support brewing and enthusiast members in order to promote and protect the brewing industry in the state. 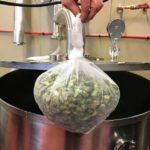 On their website, they wrote an article about OldeBBC and highlighted our unique approach to connecting brewing with the local history and economy, and how we utilize local products in the production of many of our brews. Written by John Jennings on February 12, 2018 . Posted in Uncategorized. 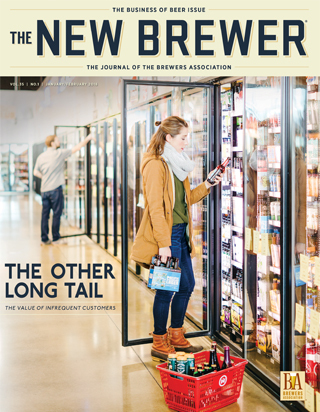 The January/February 2018 issue of “The New Brewer” magazine features breweries utilizing unique synergistic relationships with other businesses to expand their customer base. The magazine is published by the Brewers Association, which supports small and independent craft breweries. This issue’s topic was “the Business of Beer”. It focused on the value of infrequent customers, unusual business models, exports, ESOPs, and satellite tasting rooms. It highlights the OldeBBC and Fat Jimmy’s innovative business model. The article describes another brewery which combined a bicycle repair shop and a brewery under one roof. They found that a lot of cyclists either begin or end their day at the brewery. “We hope to find a similar interest from the customer’s of Fat Jimmy’s”, owner Dave Heller said. Jimmy Fungaroli, a long-time friend of the Hellers, owns Fat Jimmy’s Outfitters. He offered them space last year. OldeBBC will utilize 1500 square feet inside his building and another 500 square feet outside for a patio. 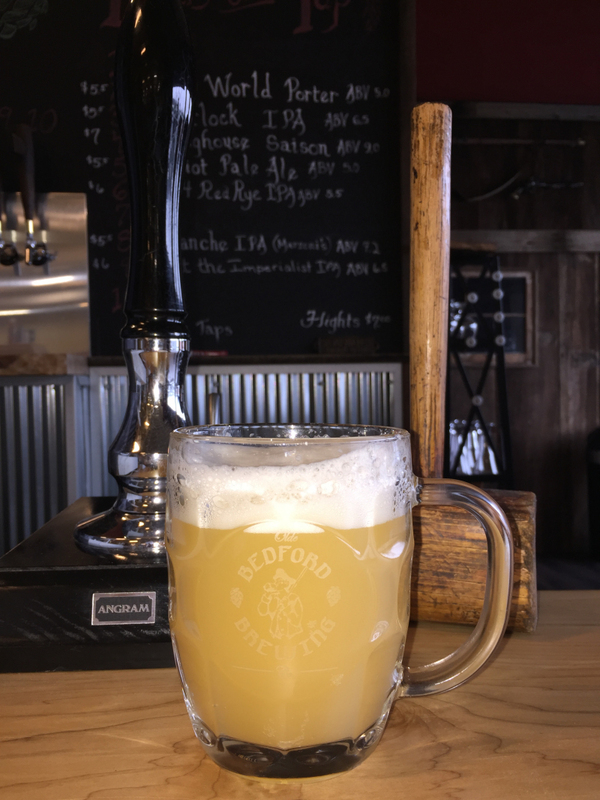 A split-rail fence will wall off the brewing business from the sporting goods store. The businesses are co-located at 109 Railroad Street, in Bedford, PA. The businesses will attempt to find synergies between their customers. For example, participants in Fat Jimmy’s weekly cycling classes will receive a dollar off pints. Additionally, Olde Bedford Brewing Company plans to open a remote taproom at the Heller’s Hideaway Ranch, near the Blue Knob State Park. Riders who take advantage of the beautiful scenery and incredible biking trails will be able to stop in for a cold beer during their ride. The Brewery intends to open this Spring. Visit their Facebook page for more information. Written by John Jennings on December 25, 2017 . Posted in Uncategorized. During the time leading up to the famous Whiskey Rebellion of 1794, Philadelphia’s and Bedford’s favorite visitor, George Washington, was himself partial to a good Porter (a roasty, caramelly beer). (Baron, 1962) Additionally, in the 1760s, he was known to purchase his porter from Robert Hare of Philadelphia. (Baron, 1962) During the 1790s, Washington was also purchasing his Porter from another Philadelphia brewer, Benjamin Morris. (Baron, 1962) Additionally, by 1796, as Washington was finalizing his plans for leaving his presidency, he “… procure a groce of good Porter to be taken there….” (Baron, 1962) OBBC would argue, when George came to put down the Whiskey Rebellion, he continued to enjoy a good Porter! OldeBBC reviewed the Store Ledger kept by Martin Reiley 1788-1816, Bedford, PA. (Reiley, 1788) This examination provided us with a window into the past. The use of distilled spirits in around Bedford, as a local commodity, is evident while examining the many eateries with the words, Gin, Whiskey, Wine, Sherry, and French Brandy. But a closer examination of some of the entries, reveals the possible evidence of the spirit of homebrewing and beer consumption in the county. Consequently, we believe these are clues to an undiscovered Bedford County brewing tradition. According to the ledger, In 1797, Conrad Atley, purchased along with other sundries, some British Ale. 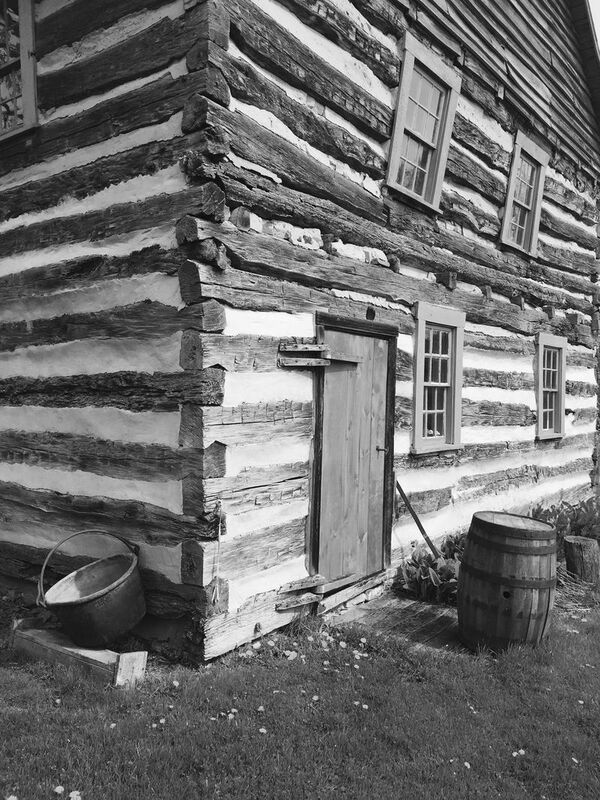 Later, in 1798, Jacob Helm purchased some molasses along with wine and other sundries. (Reiley, 1788) During this time, molasses was one of the key ingredients of a small beer recipe. (Baron, 1962) Also, in 1798, Noah Bowser purchased a “Kettle.” (Reiley, 1788) A brew kettle is a critical part of the brewing process, even in today’s brewing process. Although OldeBBC may never know if these precursors were used to brew beer, we would like to think so. Therefore, it is this tradition, OldeBBC will embrace.